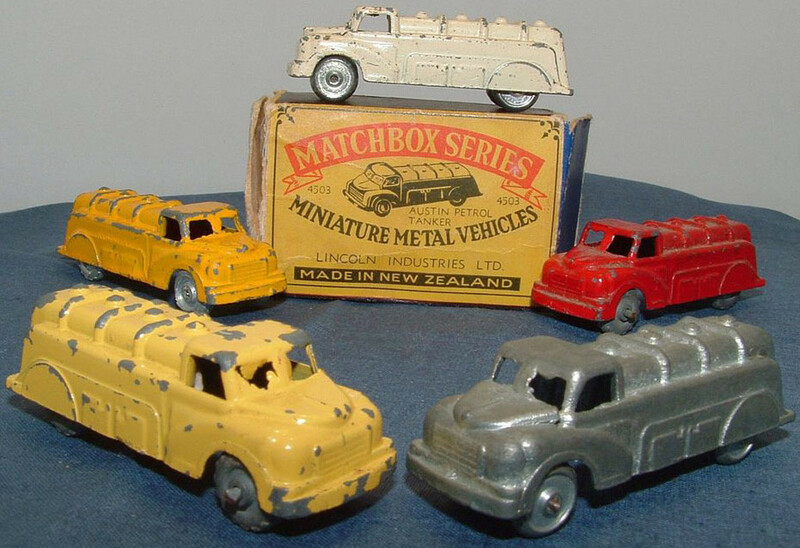 The Lincoln Matchbox Series models first appeared in New Zealand somewhere between 1956 and 1962. The toys were produced by Lincoln Industries of New Zealand and were sold only in New Zealand. Lincoln Industries Limited operated in Auckland, New Zealand and produced a range of toys that were marketed under the slogan “Boy Oh Boy! A Lincoln Toy!”. Lincoln Toys were named after Lincoln Laidlaw, owner of the company. 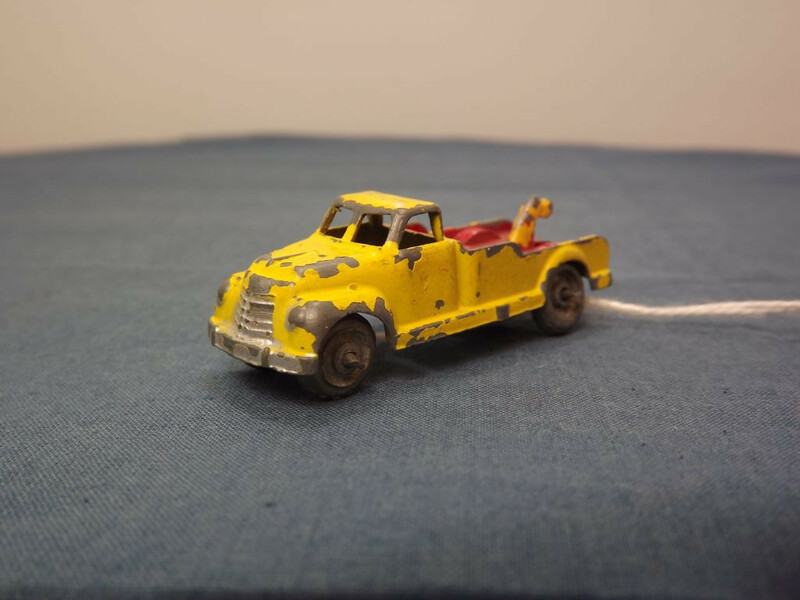 The original “Matchbox Series” toys were produced from dies sourced in Australia. 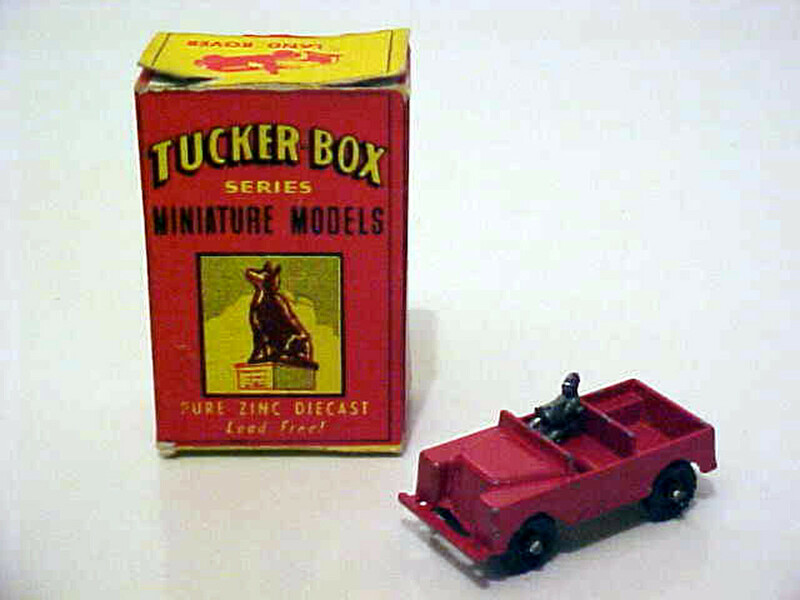 Certainly “Tuckerbox Toys” were produced in the 1950s in Australia and the models are indistinguishable from those made under the Lincoln name. It appears Tuckerbox Toys first appeared in 1957 or 1958. They were produced in Melbourne and distributed by Alex Tolmer and Associates, a Melbourne company. According to one collector I spoke to, comparisons of the typeface used on the boxes with that used in advertising and sales materials from 1958 indicate they first appeared on the market not earlier than 1957. 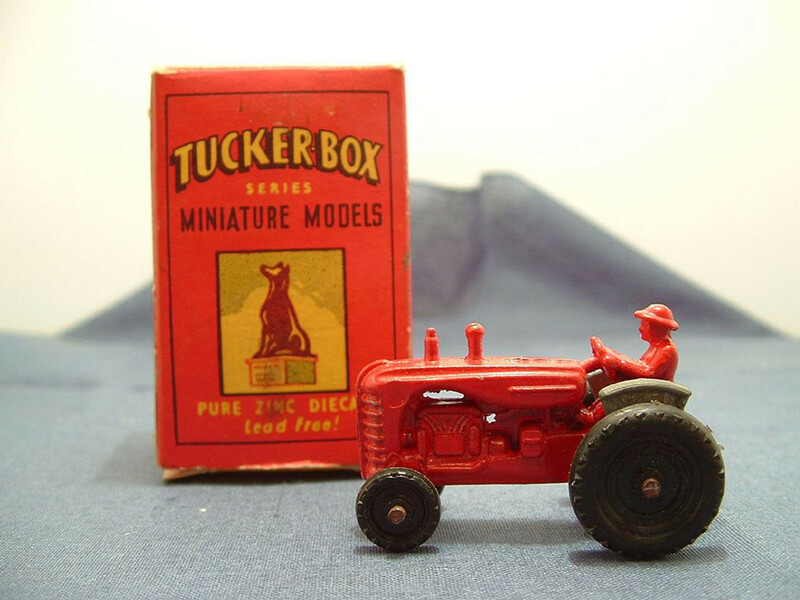 Tucker Box were issued in colourful boxes of about the same size as the Lesney “Matchbox Toys” box. 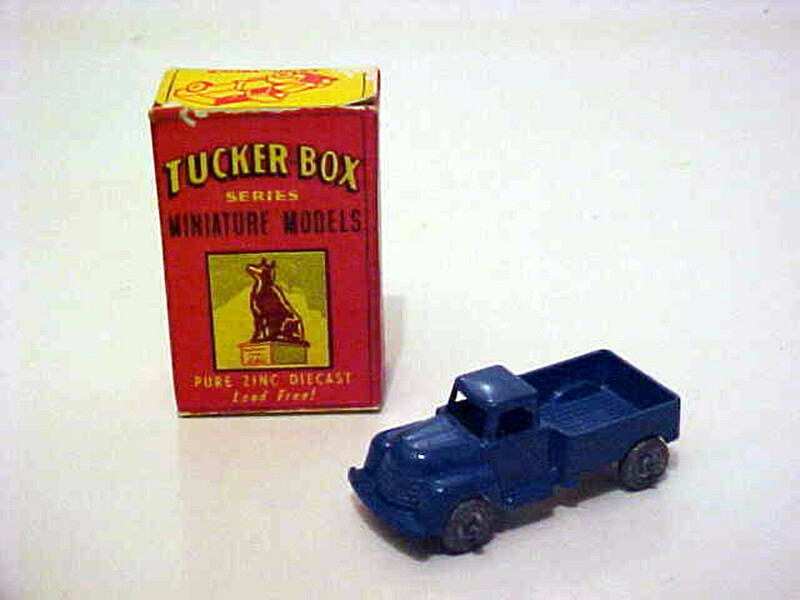 Tucker Box released only five models that I know of. They are: Austin Petrol Tanker, Fire Engine, Massey Harris Tractor, Landrover and Sand Truck. The dies then came into the hands of Lincoln Laidlaw whose company, Lincoln Industries was based on Great South Road, Penrose, Auckland during the 1950s. Lincoln Industries was established around 1946 when Mr Laidlaw took over a business originally founded by Higgins and Clotworthy. Lincoln Industries should not be confused with the North American companies, Lincoln Specialties who also produced a range known as “Lincoln Toys” and Lincoln White Metal Works who produced a range of slush metal cast toys.1 The NZ company went on to produce a range of products, including toys, that were distributed throughout New Zealand. The property at Great South Road was purchased around 1954-55 and the factory was extended during the period 1958-59. The first Lincoln Toy was produced in 1948 to use the production facilities during off-peak production periods. This toy was a gyroscopic spinning top made of tinplate. I have been unable to find any other reference to this toy nor have I been able to find anyone who has photos of this item. Lincoln, in the early 50s, was producing a variety of toys to use up this off-peak production capability, among which the brands Micro models and Major models are recognisable. However, Lincoln also produced various other toys, in both plastic and metal, that were generally unmarked as to their origin or maker. 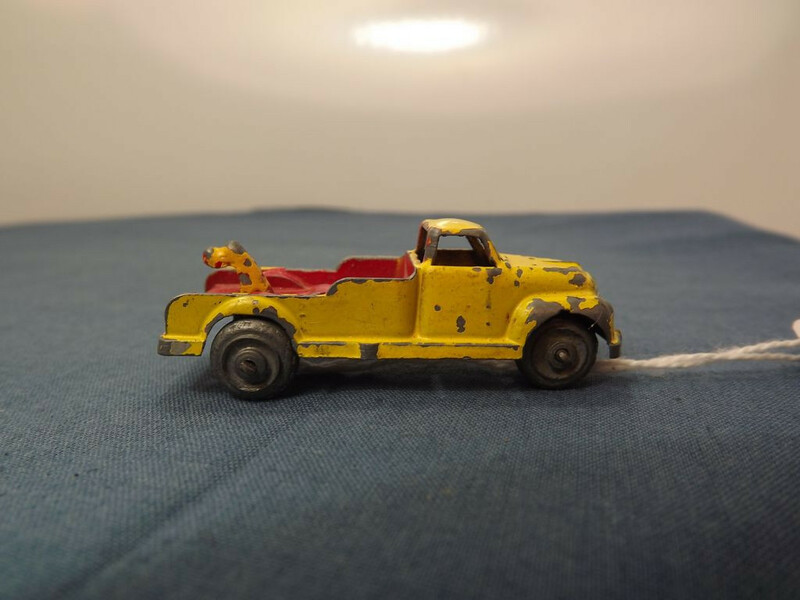 Among the metal diecast toys were a 1948 Studebaker Champion, a sports car, a Mustang aeroplane, a tractor, a bulldozer and a crane. 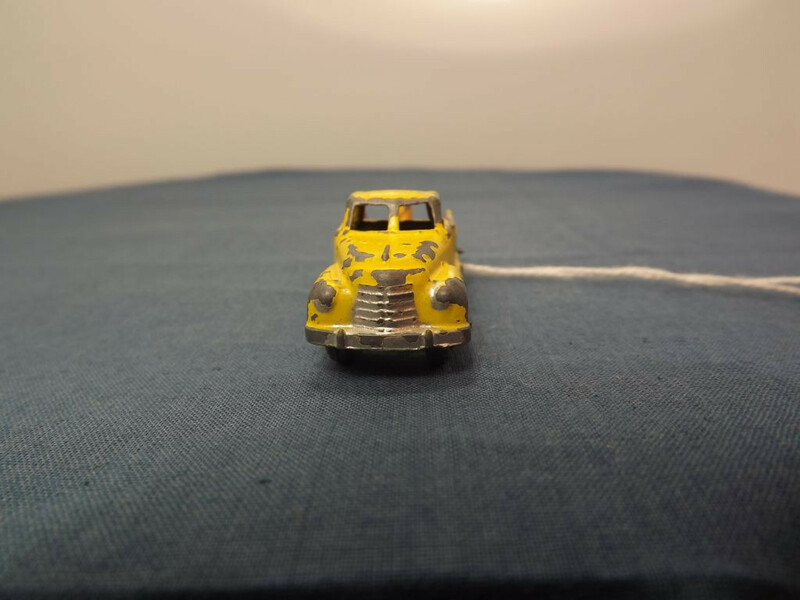 As previously mentioned, Lincoln Industries began production of the “Matchbox Series” toys somewhere around 1958 from the dies obtained from Australia. Information is sketchy about exactly when they were first released, which models were actually released in the “Matchbox Series” boxes and exactly why Lincoln Industries chose to imitate the Lesney Matchbox Toys name and packaging. Another similarity between the boxes is that they both have “striker” panels on two sides. What is known is that the “Matchbox Series” models were issued using the 4500 series numbers (printed on the box) and that 7 or 8 models** were released before the threat of legal action by Lesney led to a name and packaging change. Production runs of each model are thought to have been around the 12000 mark as this was the standard run for Lincoln at the time. 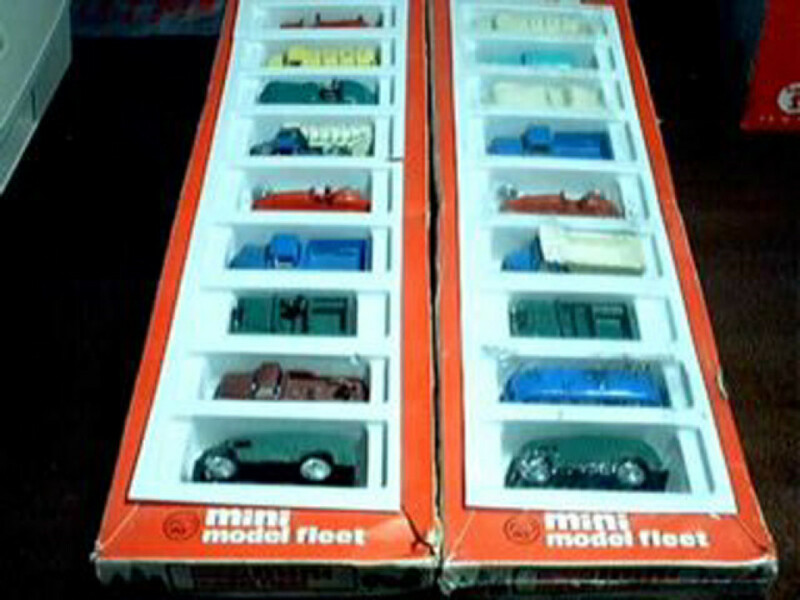 ** Now known to be at least 11 models issued in the distinctive "matchbox" packaging. It is possible others were issued in the “Matchbox Series” boxes but I have not been able to confirm this through photographic or other means. If the printing on the boxes is anything to go by, it was certainly planned as the inner flaps of each box contain line drawings. I have identified drawings of eleven vehicles on the inner flaps of boxed vehicles in my possession - the racing car, tow truck, bus, pantechnicon, petrol tanker, fire engine, utility truck, tractor, small van/ambulance, Landrover and Jaguar and Robert Newson's site now has photographic evidence that confirms these were issued in the boxes. 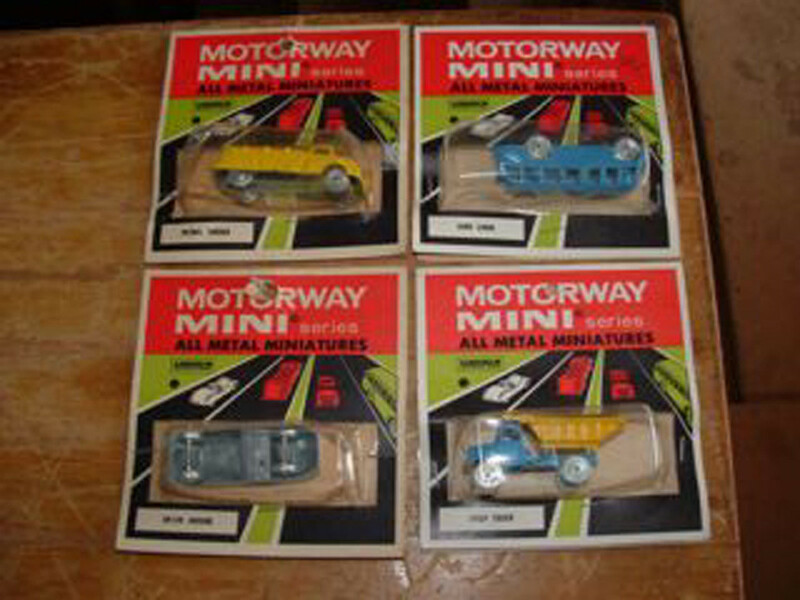 The packaging used in the “new” series was a standard bubble pack of the time with the backing card depicting a motorway scene. 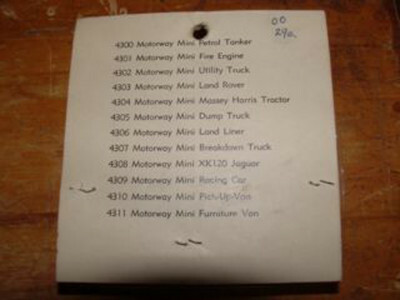 On the reverse of the backing card was a list of the full range of models, numbered 4300 to 4311. Modifications were also made at this time to the models. Most of the models that had previously been issued with a small diecast driver became driver-less and the Ambulance became a Light Van. The wheels changed from coarse treaded metal wheels with crimped axles to smooth discs (referred to in some instances as “Go Wheels”) that were attached to a pointed, non-crimped axle. 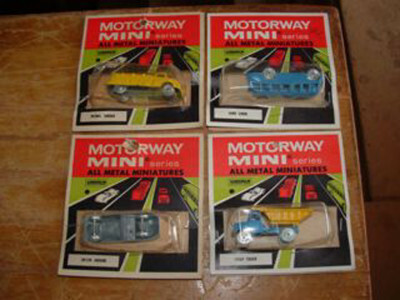 Also during the 1960s a gift set containing nine of the Motorway Mini series was issued. The contents of this gift set may have changed according to production schedules however I cannot comment authoritatively on this as I have only ever seen two of these gift sets. Both sets are in my possession, one is original and still in the original cellophane and the other has clearly been “reassembled” in original cardboard and plastic packaging without the cellophane covering. There are different models in each set. In the mid 1960s Lincoln Industries expanded into Hong Kong and decided to move its production facilities to take advantage of cheaper production costs. The dies for this series were sent to Lincoln’s Hong Kong factory and modified to include the legend “Made in Hong Kong”. Toys bearing this legend first appeared around 1966. Other changes to occur at this time included the introduction of two-tone and multiple colour schemes for the models. This was achieved by mask spraying the components as required. It is assumed that the Hong Kong models were also packaged in bubble packs with cardboard backing. The wheels remained as smooth discs on pointed, non-crimped axles. The Hong Kong models were exported to Great Britain and are apparently commonly found in the swap meets there in the two-tone and multiple colour schemes. It is possible that they were never exported from Hong Kong to New Zealand as I have never come across any in this country in other than the single colour paint scheme or unpainted. The unpainted models made their appearance in New Zealand around the same time that Lincoln Industries were preparing to shift manufacturing to Hong Kong and were sold un-packaged in some of the major department stores such as McKenzies’ and Woolworths’. In 1984 Lincoln Industries (or Lincoln International as it was now known) joined forces with the Scott Group Ltd and PC Henderson NZ Ltd.
To further confuse the issue over “Lincoln” Toys I must report that there was also a North American company that is often referred to as “Lincoln Toys”. This company operated out of Walkerville and was actually called "Lincoln Specialties". A separate company, Lincoln White Metal Works of Lincoln, Nebraska also produced slush metal cast toys but I am uncertain if these are ever referred to as "Lincoln Toys". This North American company's products have also become sought after by toy enthusiasts all over the world. In fact, some reports indicate the average "Lincoln" toy can fetch $100 to $600, depending on its condition. But before you run off to check the old toy box, be aware this particular Lincoln Toys company made wooden and tin-plate toys that were mostly aimed at the local North American market although they are found all over the world. In my opinion it would be extremely rare to find one in New Zealand. Founded by father and son, Haven and Fredrick Kimmerly, the Lincoln Specialities business made its first appearance in 1946, although the Kimmerly family had been successfully in business for a number of years before this. In 1941, the Kimmerly's and close family friends, the Lynn's, amicably split their small metal stamping business, LK Metals, into two companies. The Kimmerly's opened "Kay Manufacturing", while the Lynn's carried on as LK Metals. The two companies remained connected, with Kay Manufacturing making components for some of LK Metal's products, such as gas heaters, in addition to their own product line which consisted (in part) of fireplace covers and stove pipes. With the Second World War raging in Europe, the Canadian economy was slowly rising and business was good for Kay Manufacturing. They received an official government contract to build ammunition boxes and fenders for the Canadian Army and made a decision to change the business name to "Windsor Steel". By 1945, the wartime economy had slowed down and Windsor Steel required new products to replace the loss of the government contract. Although their flourishing automobile products division, which included gas tanks and mufflers was keeping the business steady, the Kimmerly's required something else. That same year it was suggested that the company focus its direction on the large post-war toy market. This is why Haven and Fredrick Kimmerly set up "Lincoln Specialties" in 1946 in order to market their new "Windsor Steel"-made commodity. 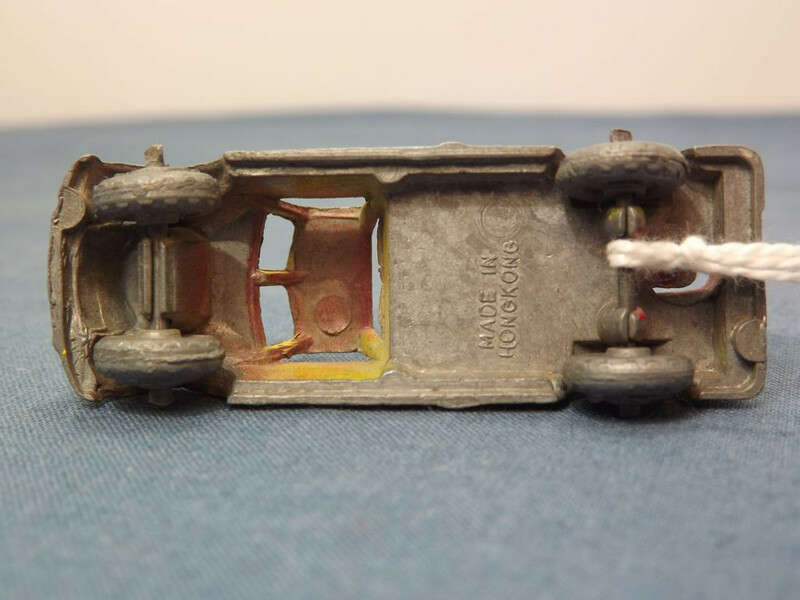 Ironically, the very first "Lincoln" toy was actually a small wooden Jeep made of two halves connected by a single joint. The joint allowed the toy to make smoother turns and handle more wear and tear. This was the only wooden toy ever marketed by Lincoln Specialties. Some of the first metal toys made by Windsor Steel for Lincoln Specialities were a dump truck and a “Repeater Canon" which fired small wooden cannon balls using a spring loaded crank mechanism. The "Repeater" was also the first "Lincoln" to appear in a major store catalogue, Eaton's Fall & Winter Catalogue of 1946-47. By 1953 the product range had grown to include over 24 styles of truck, in three different sizes and with two different cab designs. Also included were cranes, power shovels, several variations of the Massey-Harris 44 tractor and other various farm implements such as combine harvesters. One of Lincoln Specialities' most interesting products was a toy aeroplane. Considered a rarity in its time, the plane featured the colours and logos of the now defunct Trans-Canada Airways. It is currently considered very rare today. Lincoln Specialties outgrew its original location within three years and relocated. Unfortunately, despite many successes, it fell victim to increased foreign competition and unsuccessful bids by Windsor Steel to win back automotive contracts abandoned during the toy boom forced Lincoln Specialties out of business around 1958. Windsor Steel continued to operate in a limited capacity but closed a year later. Harry Ellwood, a Windsor toy maker who had relocated his company "Ellwood Toys" to Tilbury, purchased the bulk of Lincoln Specialities' dies when they closed. The only information I have so far is that the Lincoln White Metal Works company was located in Lincoln, Nebraska from about 1931 to 1940 and sold toys to Woolworth, Kress, Kresge, Schwartz Paper Co. and several other markets. Identifying these models is difficult as not all of them are specifically marked with a manufacturer's name. Some references and sellers of such unmarked toys refer to them as "orphan toys" in that they are not identifiable with known other companies. The owner of the Lincoln White Metal Works company, Clayton E Stevenson, is said to have been originally from Kansas and supposedly had connections with Western Diecasting Co., Kansas Toy & Novelty Co. and also possibly C.A.W. Novelty Co., since his toys most resemble the latter. It is thought this company may have made as many as 50 different toys. 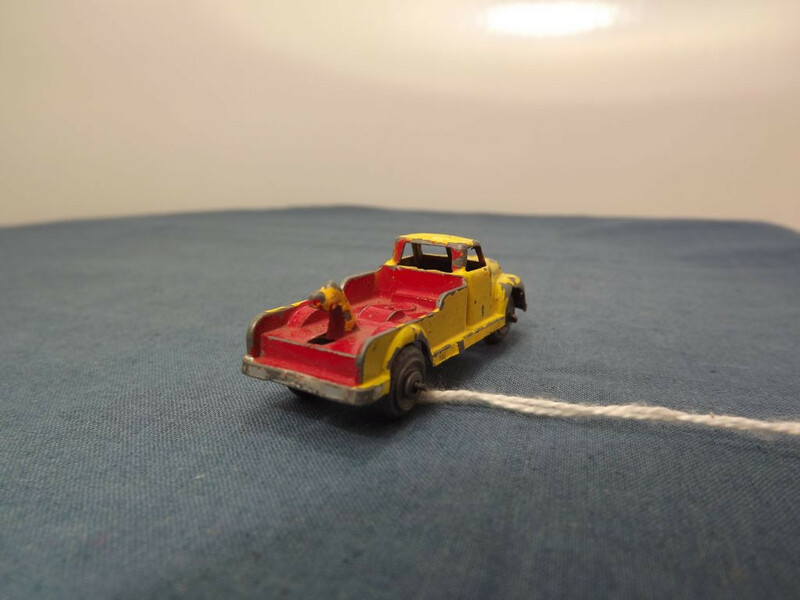 http://www.billsvintagetoygarage.com/Lincoln-White-Metal-Works has some excellent photos of their slush molded toys (racers, sedans, fire engines, tow trucks, stake bed trucks and an American locomotive) as does http://www.slushtoycars.com/Slush_Toy_Cars/Lincoln_White_Metal.html. Lincoln Tool and Manufacturing Company. This company was based in Wisconsin between 1949 and 1958. It produced a range of miniature farm tools and was based at 1000 South 5th Street, Milwaukee.